Articulate Quizmaker's timeline is a valuable tool with many features. You can arrange objects, set timings, sync animations, preview slides, and more. The timeline even has options for working with audio and video resources. Explore each of these features below. 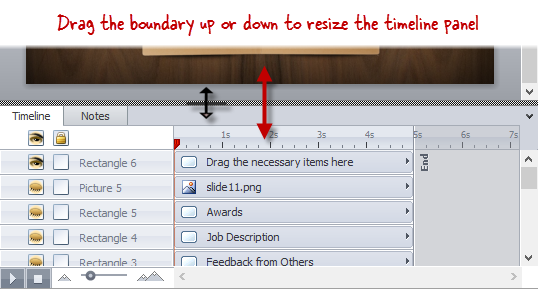 Click the arrow in the lower right corner of the slide workspace to expand the Timeline and Notes panel. You can expand the timeline panel to make it easier to work with numerous objects, or you can make it smaller to make more room for the slide stage. Just hover your mouse over the boundary between the timeline panel and the slide stage. When it changes to a two-headed arrow, drag the boundary up to expand the timeline, or drag it down to make it smaller. All objects on your slide will be listed on the timeline. Objects are listed in the same order in which they're layered on the slide, with the topmost item in the list being at the front (or topmost layer) of the slide. To change the order of objects on the slide, select an item on the timeline and drag it up or down to its new location. When there are numerous objects on a slide, you may find it helpful to hide some of them, so you can focus on other elements. To hide an object, click the eye icon that appears to the left of its name on the timeline. Click the eye icon again to unhide it. To hide or unhide all objects on a slide, click the eye icon at the top of the list. Note: Hidden objects won't appear in your published output, so remember to unhide them before you publish. You can lock objects to prevent them from accidentally being moved or modified. This is useful when you're working with other items in close proximity. To lock an object, click the empty box to the left of its name on the timeline. A padlock icon will appear, which indicates that the object is locked in place. To unlock an object, click the padlock icon. To lock or unlock all objects on a slide, click the padlock icon at the top of the list. We recommend giving objects recognizable names so they're easier to identify, especially when working with Freeform Questions. To rename an object, double-click its current name, or right-click it and choose Rename. This opens an editable text field. Type a user-friendly name for the object, and press the Enter key on your keyboard. If object names are too long to fully display in the timeline, hover your mouse over the vertical line that divides the Timeline tab and the top of the actual timeline until a two-headed arrow appears. Then drag the dividing line to the right to widen it until object names are no longer truncated. When you group objects together, they appear as a single item in the timeline. Likewise, answer choices for quiz questions are often grouped together as a single object. You can expand a grouped object in the timeline to work with its individual elements. This is helpful if you want to rename, reorder, or animate each item in the group separately. To expand a grouped object or collection of answer choices, click the triangle that appears to the left of the group in the timeline. To collapse the group, click the triangle again. To change when an object appears on the slide, drag the object left or right along the timeline. To adjust how long an object appears on the slide, drag the right edge of the object along the timeline until you reach the point at which you want it to disappear (or animate out). Align to Cue Point: This moves the object along the timeline so its starting point lines up with the Cue Point # you select. For more information about using cue points, see this tutorial. Align to Playhead: This moves the object along the timeline so its starting point lines up with the current position of the playhead (red vertical line). Show Until End: This displays the object until the end of the slide's timeline. Show Always: This displays the object for the entire duration of the slide. Timing: This opens the Timing window (shown below) where you can specify the Start Time and Duration of the object (in seconds). Cue points are markers that let you precisely align objects on the timeline. They're useful for syncing animations. Add a cue point by right-clicking anywhere in the Timeline panel and selecting Create Cue Point at Playhead. Or, add cue points on the fly by clicking the Play button in the lower left corner and pressing the C key on your keyboard at each point where you want to insert a cue point. Delete a cue point by right-clicking the cue point on the timeline and selecting Delete Cue Point. Delete all cue points on the slide by right-clicking anywhere in the Timeline panel and selecting Delete All Cue Points. Move a cue point by dragging it left or right along the timeline. To get a closer look at a portion of the timeline, drag the zoom slider to the right. To zoom out, drag the zoom slider to the left. Click the Play/Pause button once to start the playhead (red vertical line) moving along the timeline. The slide stage will change as objects appear and disappear according to their timings. Click the Play/Pause button again to pause playback. The playhead will stop at its current position on the timeline. Click the Stop button to end the preview and return the playhead to beginning of the timeline. Export Audio: This exports a copy of the selected audio track. Browse to the location where you want to save the exported audio file, give it a file name, select the file type (MP3, WAV, or both), and click the Save button.